You want to take a group hiking in the North Cascades National Park? Twelve heartbeats. That’s the limit. Anywhere from 24 to 46 legs, but only 12 heartbeats. Any combination of people and animals, but only 12 heartbeats. My group, organized under the banner Pass to Pass for Parkinson’s started with the idea of having 12 heartbeats. 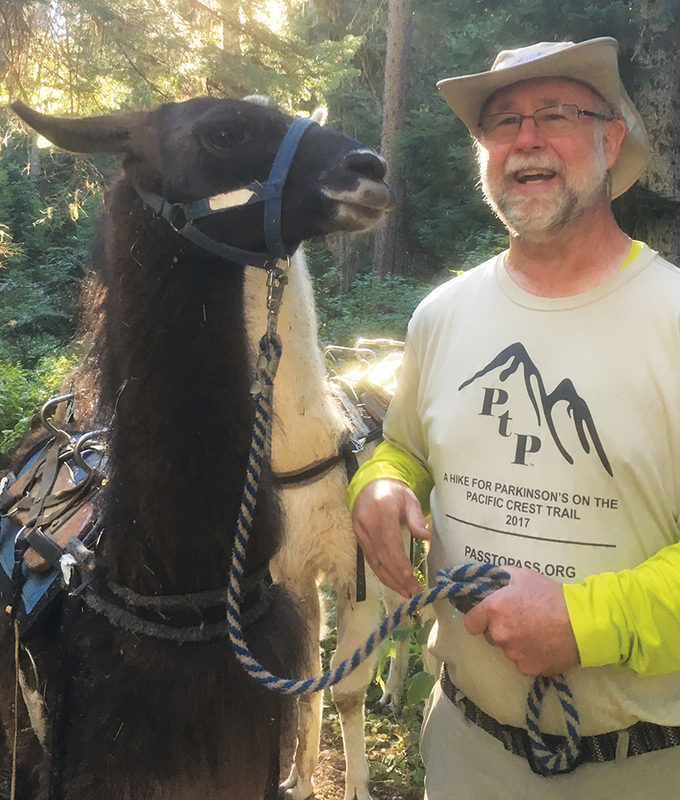 A few folks dropped out before the hike and a few never dropped in, so we ended up with only nine heartbeats and 26 legs: three llamas as pack animals, four Parky’s (people with Parkinson’s) and three support hikers. Ready to hit the trail with Wizard, F-Stop, Professor, SkyClad, Beast and Hulk. Trail names used to protect the guilty. Courtesy photo. 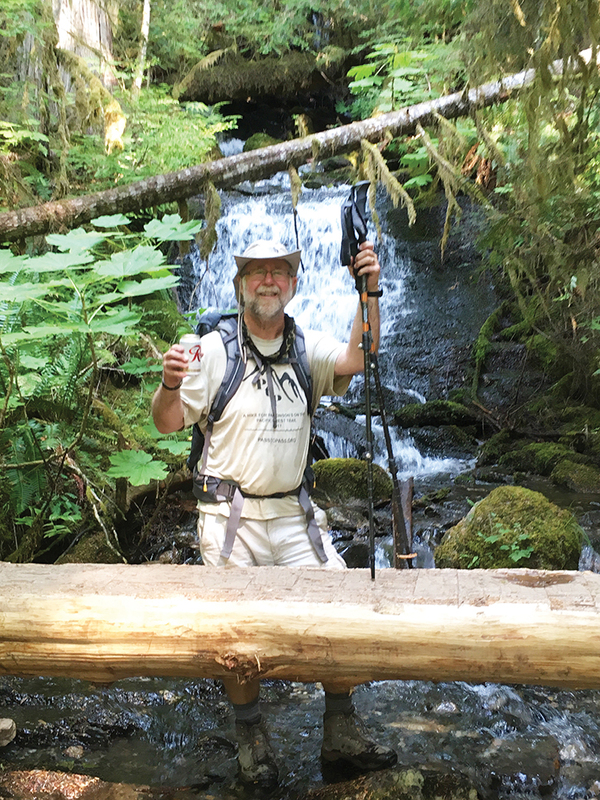 Last year, Bill (trail name, “the Beast”) organized a 70-mile hike from Stevens Pass to Snoqualmie Pass to increase awareness of Parkinson’s Disease and to raise funds for research. Having learned a great deal, he and co-founder Ken — better known on the trail as “F-Stop” — made some adjustments to increase the odds of a successful completion. 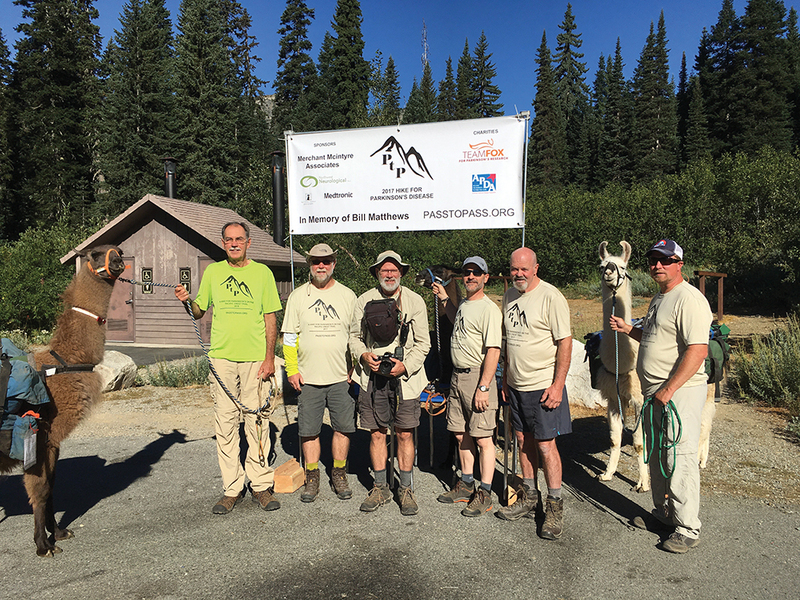 Pass to Pass 2017 was born: 58 miles from Rainy Pass to Suiattle Pass (and beyond). The Beast is a good guy who had deep brain stimulation two years ago. DBS is a type of brain surgery with electrodes implanted. A former backpacker, Bill set out to prove that Parky’s can do almost anything — including a nine-day trek in the wilderness. Bill agreed to include me, so I started what I thought was a training regimen. I got new boots, a new pack, a one-man tent and lots of other expensive little gizmos at R.E.I. After all, I hadn’t done any backpacking in over 50 years! I was to learn, much to my chagrin, that my training routine was woefully inadequate. Walking two miles a day for two weeks carrying 22 pounds up and down hills on a paved road simply wasn’t enough — even though I had been walking five miles a day since December. 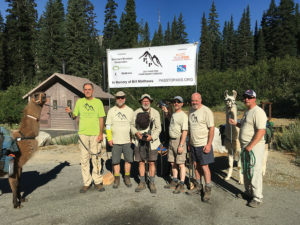 The big day came and the seven of us met each other (mostly for the first time) in Winthrop in preparation for an early morning start the next day at the Rainy Pass trailhead. If you play poker, you know the first thing to do is look around the table and figure out who is the “fish.” If you’re not sure, then the fish is you — watch out! That’s what happened to me. I looked around and realized I was the weak link — the least experienced and the least prepared. Too late. One mile to go! A.C. enjoys a Rainier Beer. Courtesy photo. We arrived at the trailhead and got a five-minute lecture on how to load the packs on the llamas. Named Fudge Mocha, Cinnamon and Salt and Pepper (what can I say, I was hungry at the time), they were docile and cooperative. Setting off with anticipatory smiles after group photos, we met our first major obstacle within a half mile. Great. Only 57 and a half miles to go. A large tree had fallen across a steep and brushy part of the trail. The llamas couldn’t go over, under or around. And we were fresh out of helicopters to hoist them over. After an hour of unpacking, blazing trail around the downfall and a fair amount of colorful language, we resumed our trek. The elevation guide showed a decrease in elevation for this section but every time we took three steps downhill, we took two more back uphill. My heel only felt slightly sore although my feet were burning after a seven-plus mile day. Apparently, I was also dehydrated as evidenced by the multiple cramps in my right calf making each step a painful experience. My feet were swollen, and I had a blister the size of a quarter — nothing a little tape (about two feet) couldn’t fix! I felt inadequate as we met many “through hikers” (those completing all 2,600-plus miles in one season) complete 25 or more miles in a day — with much heavier packs. Then again, they don’t have electrodes in their brains, balance or gait problems, tremors, freezing episodes or any of the other “joys” of Parkinson’s. Nevertheless, those folks deserve respect with a capital R. The Beast, unbelievably, had his appendix removed only two weeks before the hike—one more reason he earned his trail name. Something else (there were many something elses) I learned from Derek, aka “the Hulk,” is that hikers and trekkers soon get a trail name. For example, among the through hikers there was “Craigslist” who bought all his gear on, you guessed it, Craigslist. “Sleepy,” “Tent Chaser,” “Xtra-Tuff” (a young woman), “Princess Leia” and “Czech Chick” are self-explanatory. Within a few days, I became “the Professor”(former educator) and others in our group became “the Wizard” (Gandalf was taken), “SkyClad” (don’t ask) and “the Graduate” (think Dustin Hoffman). 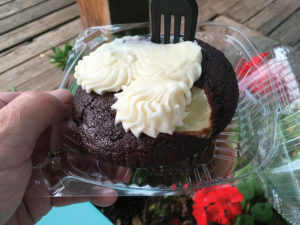 The chocolate muffin from the Bakery at Stehekin. Courtesy photo. The second day was worse than the first; or so it seemed. The blister popped, my feet still burned but I did stay hydrated thanks to the Wizard’s electrolyte tablets. The leg cramps were only marginally better. I also learned something else — don’t leave your tent unzipped. Apparently, my new tent emitted chemicals that acted as love pheromones to some bald-faced hornets. Without going into all the gory details, I got five stings in less than an hour. I was tired and sore and not sure I could finish. We had only gone 15 miles and had seven days and 43 miles left. A shorter five-mile day, after a purposefully late start, to High Bridge, where the shuttle bus takes you the seven miles to Stehekin, was a relief. Better yet was the layover day at the lodge. Best yet was the ice-cold beer! Yet I was really feeling like I was dragging the group down — slow, not carrying my fair share of the load and not at all confident I could finish. If someone had offered me a free ticket for the twice-daily boat to Chelan, I think I would have quit. I almost cried every time it departed the pier. We had only traveled 20 miles in three days and had 38 miles to go over five days. One of them was supposed to be a rest day. That meant nine miles a day… all uphill. I didn’t think I could do it. Stehekin. What a cool name for a cool place. You get there by boat, by sea plane or you take the shuttle after hiking twenty or more miles. No roads lead to Stehekin. There’s a lodge with restaurant and general store, a post office, a laundromat, public showers and one pay phone. Mix in a few homes, some boats, an old schoolhouse, a waterfall and a ranch with cabins and you pretty much have it. Pretty much. But not all. Whatever you do, don’t miss the bakery. Walk, rent a bike or take the shuttle, but don’t miss the bakery. When through hikers start the Pacific Crest Trail in Mexico and head north for over 2,600 miles, they hear about the bakery in Stehekin within the first hundred miles. It becomes a beacon, an icon a legend to be sought after. Simply put, the bakery at Stehekin is Jason’s golden fleece. Hikers are willing to overcome any obstacle to get there. Getting ready to hit the trail with Fudge Mocha, the lead llama. Courtesy photo. After a cinnamon bun (outstanding) and a chocolate muffin with cream cheese (to die for), I began to think I might possibly be able to finish. The real bed and the non-freeze dried meals also had a role. In reality, it was the numerous pep talks by the group and individuals, the encouragement, the support, the sense of community, and the spirit of unity that made the difference. Also, the cramps were going away. The fateful decision to continue was made. Come hell or high water, I was committed. Somehow, a mental switch was thrown. The mental, physical and emotional exhaustion I had been feeling evaporated. No, that’s a lie. It just simmered below the surface at an acceptable level. I was still the weak link, but I was part of the chain and we were in it together. Because we had done some re-supply and dropping off of unneeded gear, the llamas had more room in their packs and I could lighten my load. Somehow, the next two days — 10 miles each of mostly uphill — were doable and bearable. We had trekked 40 miles and had only 18 to go over the three days. After nearing the Suiattle Pass, we agreed to hike three miles up and over on our layover day to make the last two (mostly downhill days) even easier. It’s time for another “something else I learned.” Just as the first three so-called downhill days involved many uphill steps as well, the 10-mile uphill climb almost defeated me. After hiking six miles and gaining nearly 2,000 feet of elevation, we started a 500-foot descent — all the while knowing we had to regain that altitude and add another 500 feet on top of that. Each step downward was like another hornet sting. Not really. But it was painful. The campsites over the six nights of sleeping on the ground varied from primitive (dig your own latrine) to the positively luxurious with a wooden toilet in an outdoor outhouse. Except, the outhouse had no walls, but it had a tremendous view. Common sense placed it a hundred yards from the tents. We slept in an alpine meadow, next to a stream, near a waterfall and in a cedar grove. Water came from the nearest source—up to a quarter mile away. That’s when I realized why we had support hikers. As we Parky’s dealt with our own issues at camp, the Wizard, the Graduate and SkyClad schlepped water to the community filter, boiled water for the freeze-dried delights and passed around the watermelon. Watermelon? Why not. We had the llamas and the room. On the second night, we all shared slices of ice cold watermelon. Did I mention it had been cooling in a snowmelt stream? At first, we were concerned that the Hulk was a little anti-social. As an early onset parky (diagnosed at age 40), he was 20 or more years younger than everyone but the Graduate. It turned out that he was combining video he took each day with some of our photos into an on-the-fly movie of our adventure. It’s available on the passtopass.org website and is worth a look. The Hulk mostly used F-Stop’s photos. He was the professional photographer in the group. If you watch the video, you will see SkyClad with the world’s smallest cutthroat. Catch and release! A final something else I learned… Downhill is easier but harder. Uphill is harder but easier. OK, OK. I know. It’s a Zen thing. The final day arrived and everyone had a little extra spring in their step. Only six and a half miles to go and then a potluck followed by a long drive home. This leg, almost all downhill to the trailhead, seemed longer than the ten-mile uphill hike. Then, it happened. With a mile to go, we discovered the six pack of beer left in a cold mountain stream under a waterfall by one of the trail angels. It was cheap beer. It was also the best one I’ve ever had. Another mile and we were done. Immediately, it didn’t seem that it was so hard. I forgot my pain. I dismissed my mental anguish. I was ready to sign up for next year. I wish that was the truth. It isn’t. Instead, I was simply glad that it was over. I was glad I did it. I was glad I was part of an incredible group of new friends. I was grateful for the support and the sense of accomplishment. I didn’t let myself down and more importantly, I didn’t let the others down. The chain remained unbroken. Previous story Why haven’t you heard of Kaniksu Health Services?